All lever locksets are not the same! Maziuk chose the USCAN grade 2 lever for its choice of materials, durability, and long standing reputation. 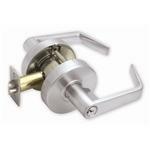 USL150Dx626 G1 LEVER ENTRANCE 2-3/4"